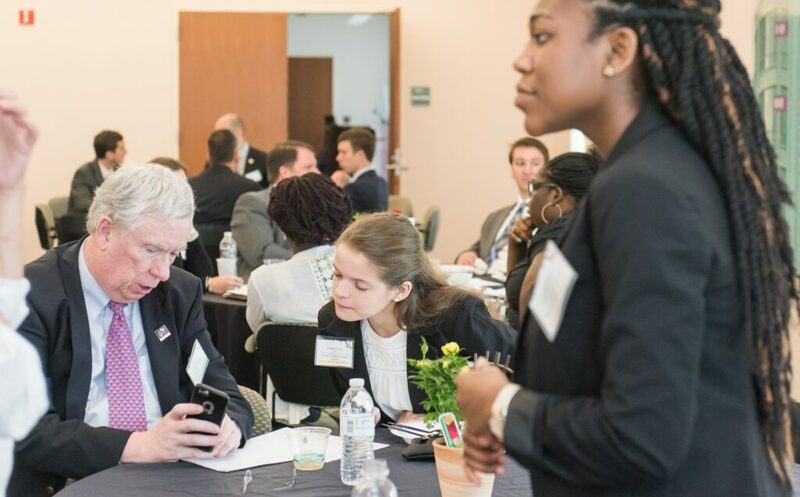 UMBC has marked the start of summer by hosting statewide kickoff events for Maryland’s newest group of public service scholars, who will serve at state agencies and nonprofits over the coming months. 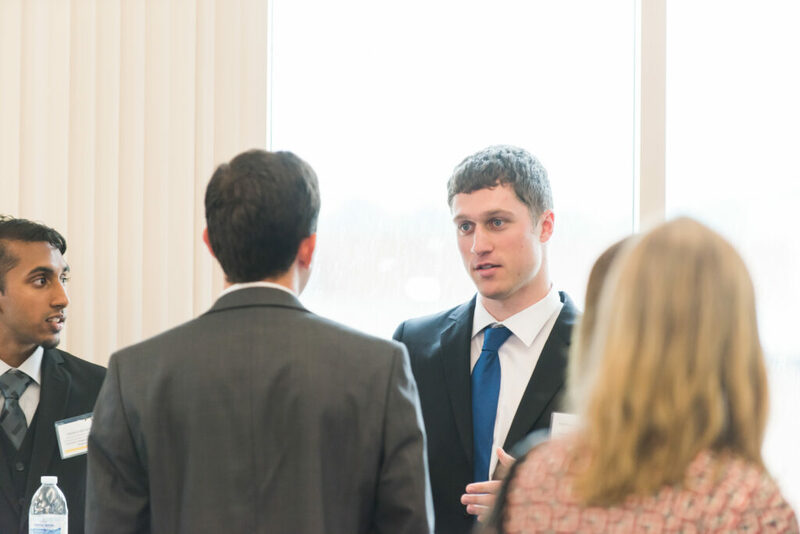 The state’s four public service scholar initiatives include the Governor’s Summer Internship Program, Maryland Nonprofit Leadership Program, MDOT Fellows Program, and Public Service Law Fellowship. This year, UMBC hosted welcome events on June 5th for scholars from the first two programs, including students from UMBC, Duke University, the University of Delaware, Penn State, UNC-Chapel Hill, Bowie State University, Johns Hopkins University, and several others, who have all been paired with mentors at leading institutions and agencies in Maryland. Governor’s Summer Internship Program fellow Carrie Cook (center) of UMBC connects with a participating mentor prior to the start of the kickoff event. 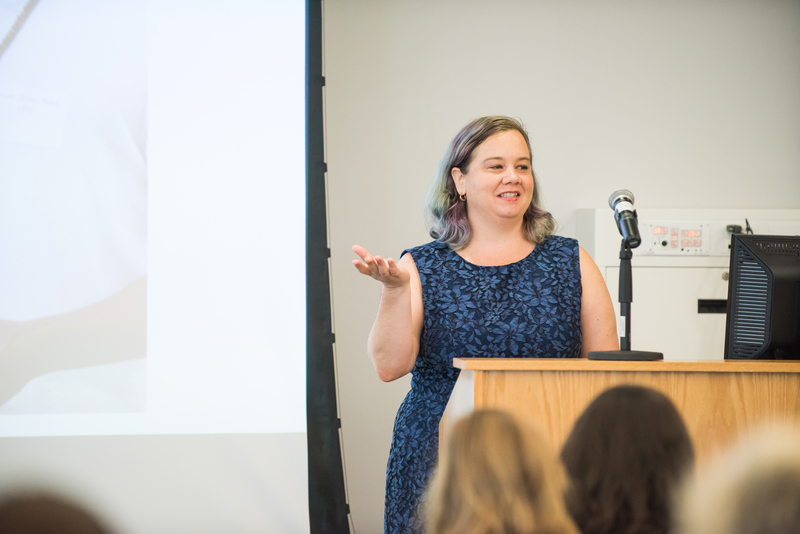 Shriver Center Peaceworker alumna Meghann Shutt, M.P.P. 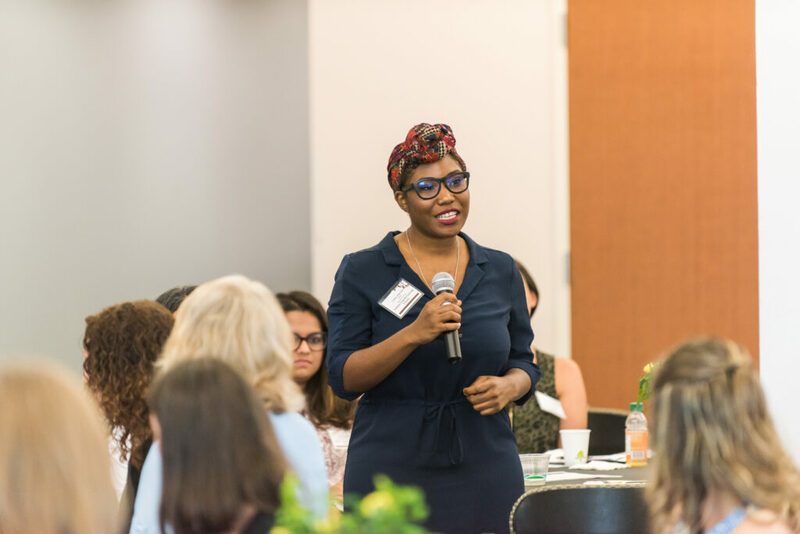 ’11, public policy, offered an opening keynote for the Walter Sondheim Jr. Maryland Nonprofit Leadership Program, which combines full-time paid nonprofit placement under a senior-level mentor with research and reflection exercises, training seminars, and networking opportunities. Meghann Shutt speaks at the Walter Sondheim Jr. Maryland Nonprofit Leadership Program kickoff event. To move past those difficult moments, she suggested connecting with great leaders to learn from; thinking several steps ahead in your work; knowing when to protect your time and energy by saying “no” to a project; communicating honestly with those around you; appreciating coworkers as full, complex people; and carefully assessing what is and isn’t working, so you can know when to end or transform a project. Five UMBC students will serve as Nonprofit Leadership Fellows for 2017. Markya Reed ’18, psychology, will work with CASA of Baltimore, leading the development of LGBT and teen parent resource guides for programs that train foster care advocates. Sarah Bicknell ’18, environmental studies and philosophy, will intern with the Baltimore Community ToolBank, which lends tools to charitable groups. Ciara Christian, M.A. ’18, applied sociology, will assist the Baltimore Neighborhood Indicators Alliance with Baltimore Data Day, where over 300 organizations come together to learn how they can use data to support Baltimore communities. Rebecca Mann ’19, social work and anthropology, will work with the Family Crisis Center of Baltimore County, and Noah Owens ’19, information systems, will serve with Playworks Maryland. Ciara Christian speaks at the kickoff event for the Walter Sondheim Jr. Maryland Nonprofit Leadership Program. The Governor’s Summer Internship Program, the state’s first formal public service scholars program, is now in its 30th year. The program includes full-time paid placement with a government agency under a senior-level mentor, seminars focused on state government and policymaking, events and meetings to connect with state leaders, and an opportunity to research and prepare policy analysis and recommendations to present to the governor. 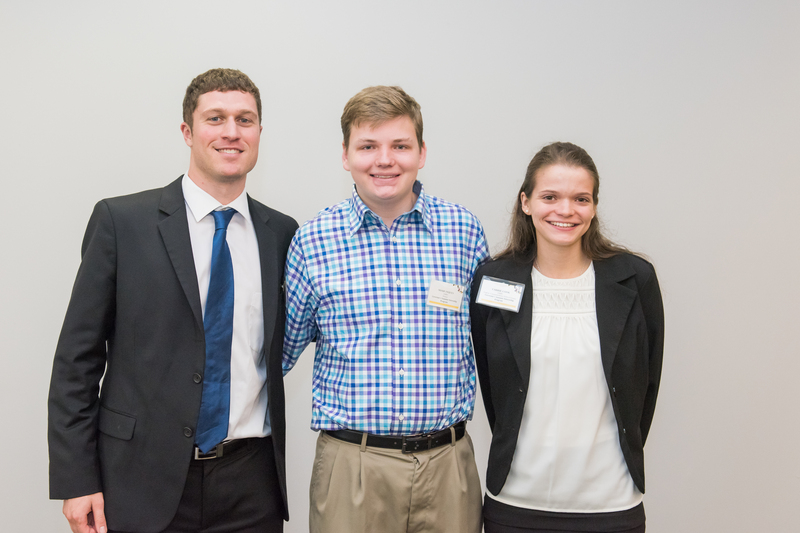 UMBC’s Governor’s Summer Internship Program participants at the kickoff event (l-r): Victor Mercogliano, Noah Jaques, and Carrie Cook. Victor Mercogliano (center) connects with program interns and mentors at the June 5th kickoff event. Four additional UMBC students were named MDOT Fellows at a program kick off later in the week, held at the headquarters of the Maryland Department of Transportation. They include Idrissou Adam ’18, social work, in the Motor Vehicles Administration’s Aggressive Driving and Motorcycle Safety Unit; Janiqua Dunn ’17, psychology, working with the Maryland Transportation Authority’s deputy chief financial officer; Ethan Griffin ’18, interdisciplinary studies, working with the urban systems design team at the Washington Area Transit Office; and Jaspreet Kaur ’17 information systems, with the Maryland Aviation Administration’s Office of Safety and Risk Management. After all, said Beatty, these mentors have a lot in common with the incoming summer interns: “They are passionate about the work and the difference they are making in the lives of Marylanders,” and their careers can give today’s students a sense of what they could achieve as public service leaders. Students interested in exploring these and similar opportunities in the future can contact Hannah Schmitz, the Shriver Center’s program coordinator for applied learning. Header image: UMBC’s 2017 Maryland Nonprofit Leadership Program fellows Ciara Christian, Markya Reed, Noah Owens, Becca Mann, and Sarah Bicknell. All photos by Marlayna Demond ’11 for UMBC.